Happy October, D&D players! Let’s continue the Halloween season in style: with another spooky encounter you can use in your own D&D game. Last week, you journeyed to a Haunted Cornfield and battled a vengeful and murderous scarecrow; this week, dare to challenge a coven of hags and their nightmarish creation in a simple dungeon. This mini-adventure is not Adventurer’s League legal, but it is perfectly suited for your own home D&D game. Enjoy, Dungeon Masters! Three hags, borne from the sea, crawled up onto the rocky shore, foundering upon the stones like scaly fish grappling with unfamiliar, humanoid bodies. Their hair was the dull green of sea kelp and their skin shimmered with silver-blue scales. They gasped for air, opening disgusting mouths filled with sharp, needle-like teeth, and they slapped their webbed fingers against the earth, trying desperately to clamber onto the slick stones. As they climbed from the waves, one of the hags clutched a wretched toadfish in her slimy claws, saving its raw flesh to devour later. Time has forgotten the stormy beach that the Toadfish Sisters first climbed onto from out of the churning sea, but legends do surround their fell coven. Though they may look human, and even wear humanoid forms, these beings are anything but. They are vile fey who despise beauty and love, and will go to any lengths to stamp it out—or better yet, corrupt it into hatred and ugliness. The trio of sea hags spent their first night in the surface world huddled in a miserable cave. One tore into the flesh of her toadfish with gusto, shredding meat, bone, and muscle alike with her razor-sharp teeth. Soon all three hags began to squabble over the food, and they fought bitterly until a foolish fisherman heard the noise from the shore and decided to investigate. The moment he saw them, the three hags leapt upon him and tore him limb from limb and devoured his remains. Witnessing their combined power, the three hags swore an oath to one another over the picked-clean bones of both the fisherman and the toadfish, forever entwining their fates as the three sisters of the Toadfish Coven. Over the next half-century, the three hags named themselves Sister Soddenbrow, Sister Kelpsucker, and Sister Saltguzzler. In that same time, sisters traveled the length of the coast, lurking in caves and sunken grottos and fleeing into the waves when their location became known and adventurers came to oust them. Everywhere they traveled, the hags have carried the preserved bones of both the toadfish and the fisherman they devoured on their first night on land, as well as the magically-embalmed eyeballs of the fish and the man. But the hags were tired of running. They hated humanity, and hated fleeing from their biting blades of iron. They would create a terrible monster so that they could defend themselves against their enemies. 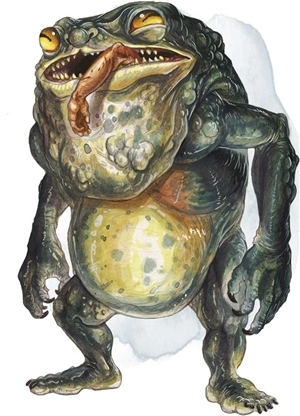 A week ago, the hags did three things of fell significance: first, they used one of the man’s embalmed eyeballs to create a hag eye (see the Hag entry in the Monster Manual), a magical trinket that allows the Toadfish Sisters to see through it remotely. Wearing this trinket around her neck, Sister Soddenbrow used an illusion to disguise herself as an ugly old man and walked into town. There she stole several armfuls of arcane herbs and a cast iron cauldron from market, and fled town. A watchman pursued her to the mouth of the cave, but the hag escaped into the cave, and the watchman was too scared to pursue. The three hags set up the cauldron in their cave and boiled gallons of sea water and crushed herbs. Then, when the mixture was just right, they cast in the bones of the toadfish and the fisherman, and watched as the concoction sizzled and slurped—and began to form into a creature. A banderhobb was gestating in the cauldron, and would continue to do so for a tenday. That tenday has passed, and the fishing village sent out a call for adventurers to help them capture the thief. “He” has not emerged from his cave, and the three brave young villagers that were sent to investigate haven’t returned, either. For the people of this town, this is no longer just about a theft anymore. It’s about discovery… and vengeance. A coven of three sea hags known as the Toadfish Sisters have camp in a deep cave near a small fishing town. In disguise, they stole a cauldron and magical herbs from the town’s market. Using these stolen items, they created a banderhobb to protect themselves from meddling adventurers. The town has hired a group of adventurers—the player characters—to catch the thieves, unaware that they are sea hags. Constable Jimenez, the watchman who failed to catch the thief, meets with the adventurers as they arrive in town and relates the story of the theft and offers them a reward of 50 gp plus whatever they find in the thief’s hideout. The thief has made his lair in Corkscrew Cave, a notoriously treacherous cave that many spelunkers have perished in over the town’s history. It apparently opens into the ocean at the bottom of the cliff, but the tides make it impossible to enter from below. He also relates that he saw the thief wearing a pendant of a glass eye around his neck; perhaps it was a good luck charm, or maybe a holy symbol. If asked to which god it belongs, he shrugs his shoulders and says he’s not a particularly religious man. The entrance to Corkscrew Cave is a gaping, ten-foot-wide hole in the ground atop a wind-wracked sea cliff. Just over one hundred feet below, the sea crashes loudly against jagged stones. A faint mist emerges from the mouth of the cave. Broad, natural steps have been carved into the floor of the cave. The steps are slick with water, but are easy to climb down, winding 30 feet down to area 2. The air grows heavy with moisture and the smell of salt as you descend deeper into the cave, and every sound you make echoes hollowly throughout the passage. The stones beneath you are slick with water and algae, and your feet slip slightly with every step you take. The passage widens out into a broad chamber with a thirty-foot-wide chasm separating you from the other end. There is a tunnel entrance on the other end, but the chasm is filled with jagged stalagmites, like the teeth of a massive shark. This 50-foot-diameter, stalagmite-filled chamber is known as “the Teeth” to local explorers, and is about as far as most of them ever get. The floor is slick with salt water, and any character that makes a Strength (Athletics) or Dexterity (Acrobatics) check, or otherwise performs a strenuous physical activity while touching the ground must succeed on a DC 15 Strength saving throw or slip and fall prone. A character that falls prone within 5 feet of the edge of the pit must succeed on an additional DC 15 Dexterity saving throw or fall into the pit. The “bottomless” pit beneath is actually a 70-foot fall that ends on the floor of area 3. Other than the stalagmites growing from the walls of the pit, there are no places to secure a rope. The stalagmites are 10 feet apart and slick with salt water, and a creature can leap from one to another if it makes a successful DC 16 Dexterity (Acrobatics) check, falling into the pit on a failure. The wall is also roughly worn and climbable; a creature that ends its turn on the wall must make a DC 16 Strength (Athletics) check or fall into the pit. The door at the far end of the cavern leads to a staircase that winds 70 feet down to the floor of area 3. This 50-foot-diameter chamber is filled with tiny waterfalls that pour out of the walls of the cave, splashing noisily on the stones below and draining away into another passage in the south. The hags rest underneath these waterfalls when not tending to their creation in area 4. The three sea hags of the Toadfish Coven, Sister Soddenbrow, Sister Kelpsucker, and Sister Saltguzzler, have met here. Unless the characters have taken extreme measures to be quiet, such as casting pass without trace or silence around themselves, the sound of their exploration within the Teeth above alerted the hags to their presence. They have all disguised themselves as hideous reflections of the three village explorers who entered this cave before the adventurers using their Illusory Appearance; Soddenbrow appears as a young man, a butcher whose flesh has been hacked apart; Kelpsucker appears as a young woman, a fisherwoman with lifeless eyes and barnacle-encrusted skin; and Saltguzzler appears as a swordswoman in padded armor, a guard in training with disfiguring leeches covering her entire body. The hags take their time toying with humanoid creatures that arrive here, using their disguises to instill a sense of dread in their victims and hopefully scare them away. When the intruders attack, lower their guard, or refuse to flee, the hags attack! As members of a coven, they possess a shared pool of powerful spells so long as all three are alive (see “Hag Covens” in the Monster Manual; spell save DC 13, +5 to hit with spell attacks). If two of the hags are killed, the last remaining hag flees to area 4. A passage at the north end of this chamber leads up to area 2, and one at south of this room leads down to area 4. If all three hags are killed, a hideous moaning and gurgling echoes up from this staircase as the banderhobb senses the death of its creators. An unsettling rhythm, like the beating of a massive heart, echoes throughout the passage leading to this chamber. Frigid rushes down the passage, chilling your ankles as you descend. The cave opens up into one final fifty-foot-wide chamber, lit only by the flickering green flames of a cooking fire. The entire chamber is flooded with 3-foot-high water, save for an island in the center that contains a massive cauldron, heated by a green fire. On the far end of the chamber is a passage to the ocean, and every few seconds, a huge blast of seafoam is kicked up into the cavern. A character that makes a successful DC 16 Wisdom (Perception) check notices that there is a large stony overhang above the entrance to this chamber—and there is a large, silhouetted figure perched atop it! The banderhobb the hags created in their stolen cauldron lurks in the shadows atop the overhang, waiting to ambush its mothers’ killers. 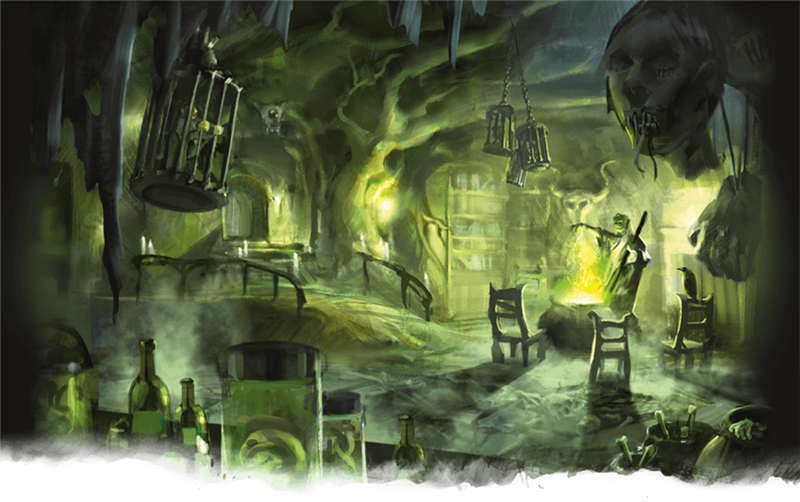 If one surviving hag fled here, it distracts the characters by cackling next to the cauldron, and then it flees into the ocean through the hole in the far side of the room on its first turn in combat. 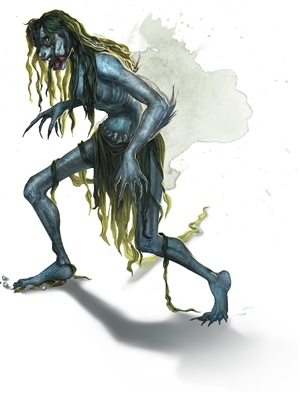 The banderhobb has a hag eye (see the Hag entry in the Monster Manual) embedded in its forehead, allowing any of the surviving Toadfish Sisters to see what it sees. In combat, it attempts to ambush and swallow the character in the back of the party, then fights to the death. It can use its Shadow Step to teleport to any point it can see within this chamber. When the banderhobb is reduced to 0 hit points, it does not die instantly. Instead, it lets out a terrible roar and, on its next turn, flees to its cauldron and climbs inside. A cloud of steam surrounds the cauldron; when it dissipates, the entire cauldron has shrunk down into an iron bowl about 1 foot in diameter. This magical vessel is a bowl of commanding water elementals with a special property: when you speak its command word, it can summon either a water elemental or a banderhobb. The summoned banderhobb otherwise follows the rules of conjure elemental, as if you had conjured a water elemental. Characters that search this room find the bones and clothes of the three young villagers scattered about this chamber. The villagers hired the characters to bring a thief to justice, recover a cauldron, and avenge the deaths of the young adventurers to went before them. Characters who defeated the hags certainly brought the thief to justice and avenged the deaths of the other adventurers, but the cauldron is beyond saving—especially since it’s shrunk down to the size of a magical bowl. The constable simply deducts the cauldron’s 2 gp cost from the characters’ 50 gp reward. James Haeck is the lead writer for D&D Beyond, the co-author of Waterdeep: Dragon Heist and the Critical Role Tal'Dorei Campaign Setting, the DM of Worlds Apart, and a freelance writer for Wizards of the Coast, the D&D Adventurers League, and Kobold Press. He lives in Seattle, Washington with his partner Hannah and his Halloween-colored familiars, Mei and Marzipan. You can usually find him wasting time on Twitter at @jamesjhaeck. Any way I can incorporate this into Waterdeep after my players are done with Dragon Heist? Definitely! Set this disturbance in a tiny corner of the Dock Ward, where the City Watch rarely lifts a finger to help the impoverished ward's downtrodden citizens. Last week? It’s been nearly 2 weeks, James! I need my spooky fix. Perfect little side quest for my homebrew campaign. Thanks. Are we missing a bit here? Both rooms 3 and 4 have the remains of the previous 3 adventurers? A few minor edits have been made to address typos noted in the comments. Is there a map of Corkscrew cave? I really like your new encounter articles! Keep them coming. I also like 101, spell spotlight and other older article series. Can you make an encounter with an Oni? That would be AWESOME!! 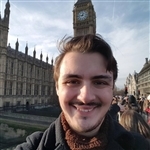 Keep up the encounters! Great ideas! I'm currently running Hoard of the Dragon Queen. Is there a convenient spot in there to run this? These names will go over well. Thank you. I also thought that maybe Jarlaxle could help. Great stuff as always, James. The dungeon is linear enough that I don't think a map is needed. Each room is essentially a 50-foot diameter dome with an entrance at one end and an exit at the other. Even if the DM gets the details a little fuzzy, it won't affect play much at all. Might run this as a one-shot for a group of guys who I work with who play Pathfinder, who never played 5e. Thanks for the inspiration! This will fit very nicely into my post Arthurian, Dark Ages campaign.